Dammit, all I did was bump the building! "It doesn't matter how much health you have. It's just... Are you dead yet? Are you dead or are you alive? If you are alive, continue fighting. If you are dead, retry." Video game characters on average are incredibly tough. No matter how much you get hurt or what it is that's doing the damage, the worst you'll show for it is blood decals on your suit. You laugh as Universal Poison does five points of damage per step, you shrug off the flying chainsaw robots using your blood to make abstract art like nothing, and you're perfectly fine as long as you have at least one Hit Point left. However, if something removes that last point, even if it was an apple falling on your head, it will cause you to experience Critical Existence Failure and keel over like you had a sudden inexplicable heart attack. Those subject to this seem to be held together more by their life force than anything tangible, as the act of dying instantly makes them as durable as wet tissue paper in a blender. Most of this is a function of fair gameplay, especially in fighting games where making a character weaker over time would just make them progressively more vulnerable and susceptible to damage. Of course, that doesn't make Cherry Tapping any less painful. It also allows certain tactics that would be downright crazy in Real Life to work in the game (e.g. using explosions for a makeshift rocket jump because you have enough HP to survive the explosion, bunny-hopping to reduce total damage taken, or running into suppressing fire to either act as a shield for the guys behind you or just get close enough to use a One-Hit Kill weapon). This could have a flimsy justification for armoured vehicles — anything which doesn't penetrate its armour arguably would not adversely affect its performance. (The same principle also applies to Deflector Shields.) 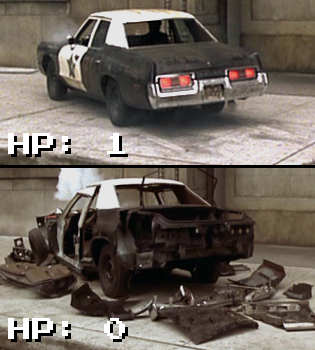 However, because of the simplified nature of damage calculations, it's entirely possible for, say, an armored vehicle to sustain an anti-tank missile to its unarmored back and still keep fighting with a few Hit Points remaining, when in Real Life it would easily cripple the vehicle and/or kill the occupants in the process. Critical Annoyance often indicates the imminence of this trope, much to the irritation of the player's eyes and/or ears. If Critical Existence Failure is always a danger, regardless of the attack, the character is a One-Hit-Point Wonder. On the other hand, if it doesn't occur immediately upon zero Hit Points, but waits for just one more hit to land, then the owner possesses a Last Chance Hit Point. Has some overlap with Death of a Thousand Cuts and No Kill Like Overkill, since any attack that inflicts even Scratch Damage can ultimately land a KO. Compare Exact Time to Failure, for more general examples of unrealistically sudden transitions from "perfectly OK" to "totally dead"; No Ontological Inertia; and Strong Flesh, Weak Steel. Contrast the Chunky Salsa Rule; Didn't Need Those Anyway! ; and Subsystem Damage, where losing Hit Points does adversely affect the owner's ability to fight back. See also Attack! Attack! Attack!, which this trope can encourage or at least give the appearance of; and The Last Straw, when a proverbial straw breaks the camel's back. If you are looking for the trope about having one's existence entirely erased from the time-space continuum, try Ret Gone. Also not to be confused with Author Existence Failure. Given that this is nearly a Universal Trope, only aversions and notable examples go here. Parodied in Gintama when the characters find themselves inside a JRPG. Hijikata, perfectly sound albeit having just 1 HP due to a game glitch, slightly bumps his foot into a wooden sign and instantaneously drops dead, complete with a coffin. Taken to extremes in Sword Art Online during the Aincrad arc: players will remain alive so long as they don't die in the game, but after their HP reaches 0, the moment their avatar vanishes, the player will be hit with a high-powered microwave pulse to their brain, killing them instantly. In Co-op Mode, James averts this by a hair on the very first chapter by being saved by Taylor.